Oral & Maxillofacial Associates of Oklahoma offers the Nobel BioCare All-on-4 in Oklahoma City, Norman, Midwest City, and Edmond, OK. To schedule an appointment call 405-848-7994 (Oklahoma City), 405-292-8900 (Norman), 405-733-4296 (Midwest City), or 405-341-4022 (Edmond). 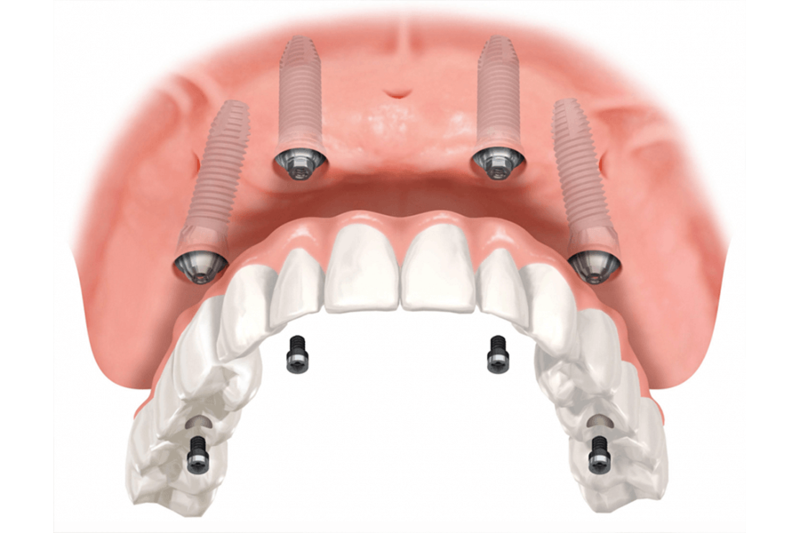 The All-On-4 provides patients whose teeth on the upper or lower jaw are missing or failing with a fixed full-arch replacement, secured to just four dental implants, on the day of surgery. This provides immediate improvement in function, aesthetics, speech, and self-esteem. Two key elements significantly reduce the complexity of this treatment: the number of surgeries and the overall treatment time. Tilting the posterior implants in a precise manner avoids the need for time-consuming bone grafting procedures, while immediate loading allows patients to receive their new teeth right away. The All-on-4 not only minimizes treatment time, it is also less costly than conventional dental implant solutions. Longer implants can be used, avoiding the need to augment the vertical bone. The tilted implants can be anchored in higher quality anterior bone, reduce cantilevering, and avoid important anatomical structures. The result is a simpler, less expensive, and faster solution for patients who are missing all of the upper or lower teeth. All-on-4 takes its name from the fact that it uses just four dental implants to secure a full, fixed arch of teeth that never leave the mouth. It was developed by implant manufacturer Nobel BioCare and European implant specialist Paulo Malo using bio-mechanics, computer simulations, and clinical research. The process requires just two steps: consultation and surgery. During the consultation, we will conduct an extensive evaluation, including a 3-D CT scan of the head and mouth. This allows us to determine whether you are a candidate for All-on-4 and to create a precise surgical guide to ensure optimal placement of your four dental implants. We will then take dental impressions for your customized arch of fixed replacement teeth. When your new teeth are ready, you will return to our office to have your dental implants placed. Following our surgical guide, we will place four titanium dental implants in strategic locations along your jawbone. The back two implants are angled to achieve maximum advantage in relation to the existing bone structure. When the implants are secure, all that is left is to attach abutments and secure your new teeth in place. It is normal to feel some discomfort after your surgery, especially if your teeth are extracted in the same appointment. If you are prescribed a painkiller, be sure to take it as directed to stay ahead of any pain. You will be able to eat a soft dinner, and you will be eating normally within a few days. Of course, you should call us right away if you experience any unusual symptoms. We will schedule you for periodic checkups over the next few months to ensure that your gums heal properly and your new implants successfully integrate with your jawbone. After that, you will just need to see your dentist for routine cleanings.